Although I was aware the Nazis did destroy and steal quite a considerable amount of significant artworks it's one of those aspects of World War II that isn't widely known in the mainstream. Which is why I feel this film is important. Not only does the movie attempt to show the massive scale of the Nazis theft it also goes some way to explaining why art actually matters to culture and people. Something that is often missed by those who tend to pass art off as frivolous to society. What I wasn't expecting was the very measured and low key pacing of the film. Whilst I was never bored the slow pace could have been filled with more character moments. Especially with great comedic actors like John Goodman and Bill Murray, who pretty much get as much screen time as everyone else but feel a little under used. John Goodman has a great, humorous line in the trailer that isn't actually used in the same scene in the film. As a quick aside it's good to see Cate Blanchett doing an authentic French accent (to my ear at least) rather than that overplayed German accent she used in the last Indiana Jones movie. 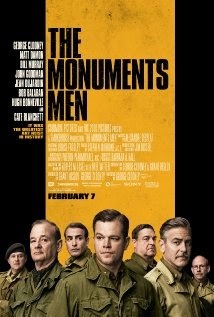 Overall The Monuments Men is a solid film with good performances from all the cast. It does have really great high moments and a few low points that may get your eyes watering. It's not quite the character driven film I was hoping for but the story is interesting and thought provoking enough to keep you entertained. You may even learn something too. Worth seeing in a cinema but it's probably a film that's going to become essential viewing for students of art history in years to come. I've just posted a comment on here about this and it hasn't shown! This happened once before, so wish I'd thought to copy and paste it just in case. Now I'll have to come back later to do it again! Why is it doing this? I copied and pasted that above comment, but I clicked to Preview it first, which I think you said worked if you did that. (glad to see they're using numbers to prove you're not a robot as the letters can be confusing) When I clicked to post it though, it came back with a panel to say that Internet Explorer had stopped working and clicked to find a solution. It's going to let me know. It said it had closed the tab and reopened it again. It might have been that that caused it but it has happened before. Must also remember to preview first perhaps. Here goes. I didn't preview that one. As I was saying in the first comment I posted, Lesley (my daughter for the benefit of anyone else that might read this) went to see this film the day after her birthday for a birthday outing, my treat, except for the movie as I only asked if she wanted to go to lunch. It was her idea to go see a film. We couldn't find anything decent to go and see, as most of them were about Super Heroes or animations. (I was looking via my Hoyts News Letter) All the good movies from a few weeks ago seemed to have vanished! She had wanted to go see 'The Wolves, or Wolf, I forget which, Of Wall Street' with Leonardo De Caprio, but it wasn't on. We even looked at other cinemas further afield, but they weren't any better. We decided on this one. It wasn't a bad film actually, though it's not one I would have chosen to go and see for me just by looking at the info etc. I didn't even know the Nazis had stolen any paintings, was the first I'd heard of it. Good well-know actors in it to make it more interesting to me, and the humour in it was good, and unexpected, given the topic. Good that they only lost two men in the process.